Get to Know Your Zinester: zach! My first zine was “Miami, You’ve Got Style”, which I co-wrote with my friend Scott. It was supposed to be a normal zine, but the project just grew and grew until it ended up being 190 pages. 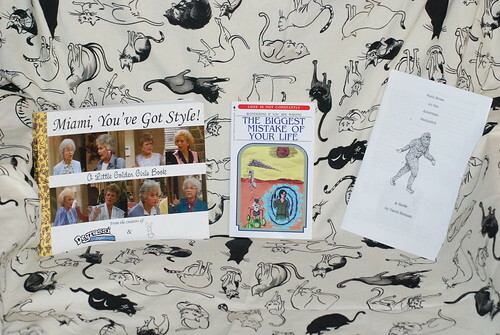 It is pictures and commentary of every outfit worn during the first season of The Golden Girls. My most recent zine is titled “My Complicated Relationship With Food”. I have ridiculous opinions about a lot of foods, and I know they are ridiculous, but I still think them because that is how brains work. Food is fine, but I think people tend to make too big of a deal out of it. Maybe my Star Trek zines, because in them I came closest to achieving my twin goals of being funny and depressing at the same time. Name three of your favorite episodes of The Simpsons. This is a really tough question! You Can Only Move Twice would probably be up there, as it features one of my all time favorite characters in Hank Scoprio. A Streetcar Named Marge would make the cut as I feel like I understand a new joke every time time I watch it. Aaaaannnnnddddd… maybe El Viaje Misterioso de Nuestro Homer aka the chili pepper episode? I like to watch tv, movies, play video games, and hang out with friends, all of which are the bane of creativity. The only time I ever get writing done is at my very boring job which involves watching people sleep. Find more from zach! at The Biggest Mistake of Your Life.